2751-1070 Features: -Extra-heavy-duty, professional toolbox.-Patented water seal makes toolbox water resistant.-Ideal for carrying power tools, hand tools, and medium to large items.-Structural foam consists of thermoplastic resin and flake mica that increases structural durability.-Portable half tray allows room for storage of larger items.-V-groove with ruler on top of lid holds materials such as lumber and pipes in place for cutting.-Black.-28”. 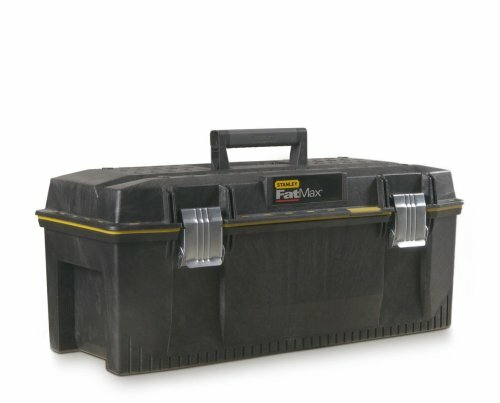 Amazon.com The Stanley 028001L FatMax 28-Inch Structural Foam Water-Resistant Toolbox offers versatility to professionals who need to keep their tools organized and protected. 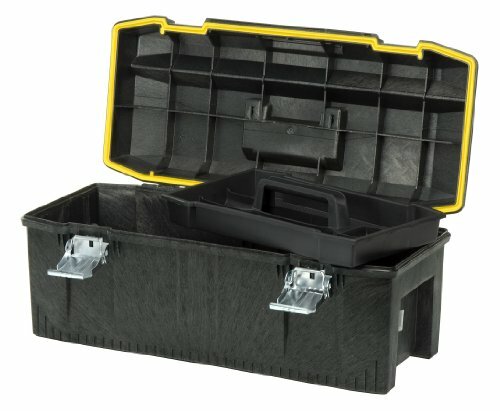 The Stanley 028001L FatMax 28-Inch Structural Foam Water-Resistant Toolbox offers versatility to professionals who need to keep their tools organized and protected. 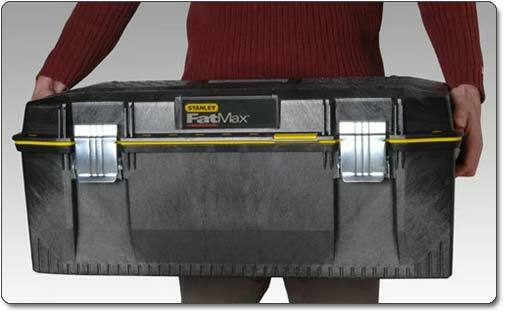 Developed from sturdy and rugged structural foam, this FatMax toolbox is a heavy-duty water-resistant unit ideal for carrying power tools, hand tools, and extra-large items. It features an all-around water seal for optimum protection of stored equipment. 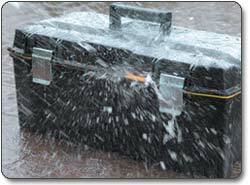 The toolbox has a water-tight seal, which makes it ideal for power tools. View larger. You’ll have plenty of options for storing your tools and gear. View larger. The FatMax 28-Inch Toolbox gives you plenty of options for storing your tools and gear. Its portable tote tray is designed to carry hand tools and small parts–and because it’s only three quarters of the length of the tool box, the tote tray allows for large tool storage within the box itself. For additional storage, the tool box features a bottom compartment that holds large, heavy items–such as power tools–with room to spare. The tool box’s lid top features a V-groove track that can help secure lumber, pipe, and other materials for easy sawing and cutting. For further convenience, the tool box is equipped with a tough soft-grip handle and ergonomic hand lifting resources to allow for easy carrying of heavy loads. This box also features large metal rust-proof latches that provide convenient locking possibilities. Proud of its reputation for excellence, Stanley is dedicated to continually testing, designing, and improving its products to ensure quality and maximum function. The company strives to maintain its standing as being the world’s best–exactly what you expect from a name like Stanley. 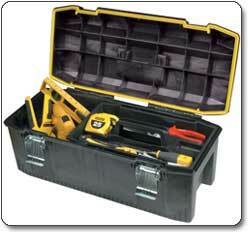 Stanley 028001L FatMax 28-Inch Structural Foam Water-Resistant Toolbox. The soft-grip handle and ergonomic design allow for easy carrying of heavy loads. toolboxes don’t work for me (too many tools) but this would serve most weekend warriors fine. a tool set has become my go-to gift for most occasions. people look at you funny but the recipients often are ecstatic when they see what a lifesaver it is. even simple tasks like hanging pictures or a curtain rod show the practicality, & who hasn’t had their life made immeauraby better via a humble screwdriver or pliers at any minor emergency? no need for super quality, even ‘junk’ usually does fine until a replacement can be had. Good size tool box made by Stanley which is a good brand, all weather durable. Handy for storing household tools , great price. dolores_kenneally has just earned 2812 MPS points from a GOLD chest!